their country at home and throughout the world. We honor their heroism and dedication." 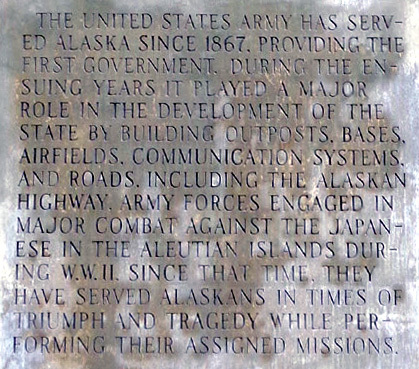 Just north of the entrance to the Byers Lake Campground, between MP 147.1 and 147.5 on the George Parks Highway, is the Medal of Honor Loop to the Alaska Veterans' Memorial, POW-MIA rest area, and the visitor center for Denali State Park. 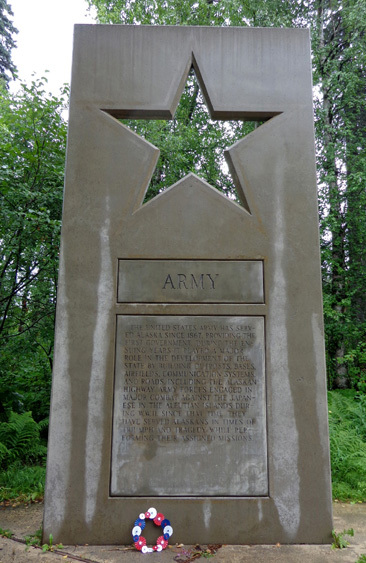 I encourage anyone traveling this highway between Anchorage and Fairbanks (or Denali National Park) to stop here for at least half an hour -- rain or shine -- to visit this impressive outdoor memorial. If it's a nice day, it'd be easy to stay longer and enjoy a picnic or relax in the beautiful surroundings. On a clear day this is reputed to be one of the best places to see Mt. McKinley AKA Denali. 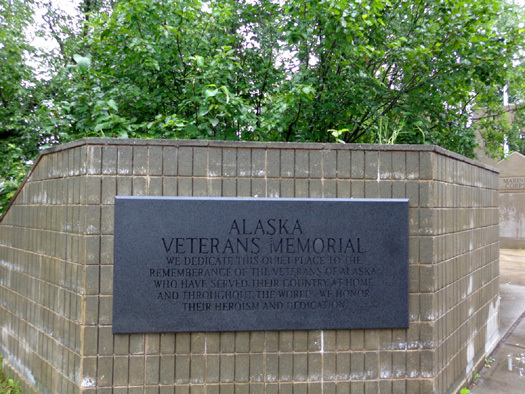 But even on the rainy day we visited we really enjoyed paying tribute to Alaska's military veterans and learning more about the role Alaska has played in various world conflicts. It's in a strategic location for the defense of our country. More about that in a bit. 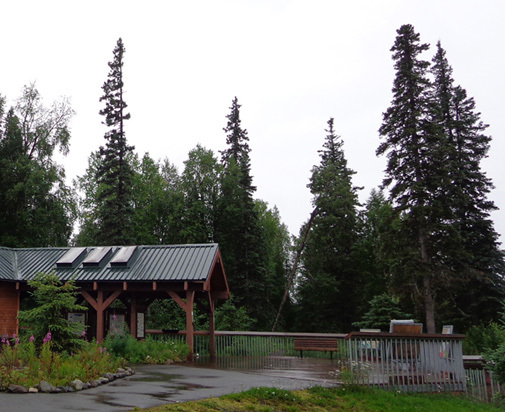 There are picnic tables in the grass and shade, water, restrooms, a pet walk, viewing scopes, and a park visitor information center. Visitors with more time and energy can also walk down the hill about half a mile to Byers Lake and the campground where we've been staying this weekend. 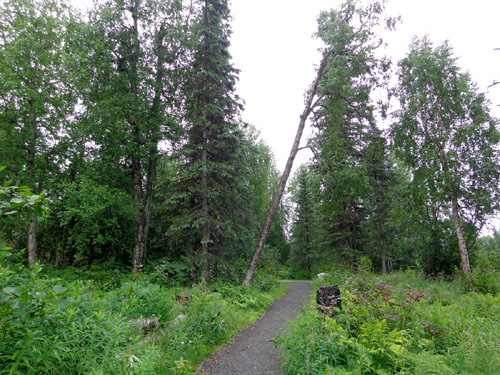 I showed photos of some of the trails in the last entry. 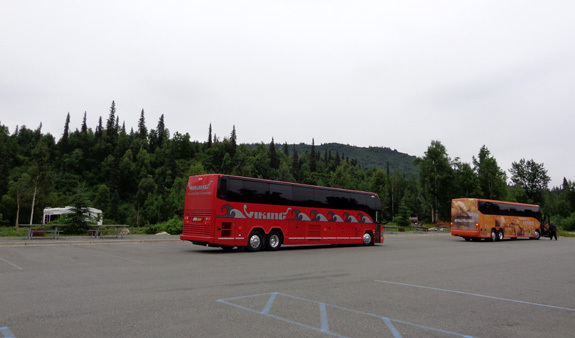 They'd be a good place to stretch your legs before resuming your journey north or south. If you'd like to stay overnight and the Byers Lake Campground is full or there are no spaces available in it for big rigs, RVs may park overnight in a designated part of the rest area for a $10 fee. 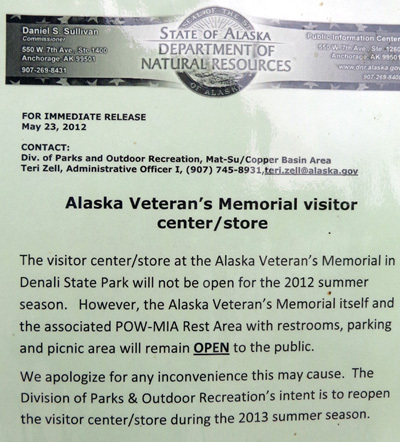 The state park visitor information center is located between the parking/picnic area and veterans' memorial. 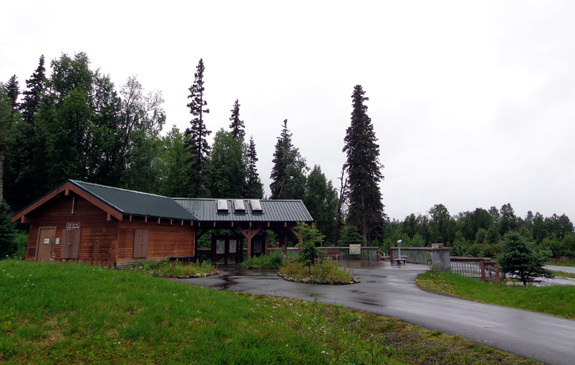 It has a large deck and several very interesting, handsome wood-framed interpretive panels that describe the continued growth of Denali (it gains 3/4" in height each year because two tectonic plates keep colliding with each other), the ways various kinds of wildlife survive the punishing winters up here, the migration and nesting cycle of trumpeter swans, clues to help you recognize the three kinds of bears you might encounter here, and other facts about nature in Interior Alaska. They either escape by flying, walking, or swimming to warmer climes, adapt to the conditions, or burrow underground until it warms up again. 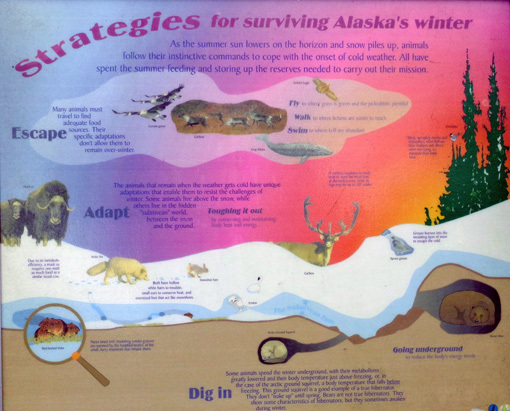 I smiled when I thought about the ways humans also do these things to deal with the cold and snow in northern environments. Many love it and adapt readily, enjoying skiing, snowshoeing, ice fishing, and other outdoor activities in the snow. Others are basically stuck in these environments for various reasons (jobs and family, e.g.) and "dig in" to cope, staying indoors as much as possible. Then there are those of us who simply escape most cold weather and snow, like the birds that migrate to Central and South America for the winter. Jim and I are poster kids for the "snowbird" RV life, only we don't go that far south. CLOSED FOR THE SEASON: THE SUMMER SEASON! I talked with a maintenance guy who was cleaning the bathrooms, which are open. I asked him what the building in the back of the parking area is, in case it was something we wanted to see. He said it's a volunteer cabin, but with the high fuel prices this year, the state park department wasn't able to get a volunteer to work at the visitor center this summer so the cabin isn't being used now. Apparently there aren't funds to pay someone to work here, either, so the visitor center is closed all summer. That's too bad. 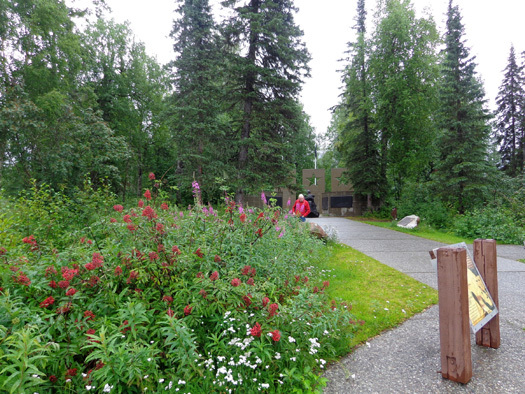 I'm sure it's a nice visitor center and we could have used more information about the park, such as a trail map. The maintenance guy searched through his truck and came up with an old park brochure to give me, so that helped a little bit but it doesn't show where all the trails are located. We can't get online anywhere near here to see if there's more information on the park's website. from the bottom up. 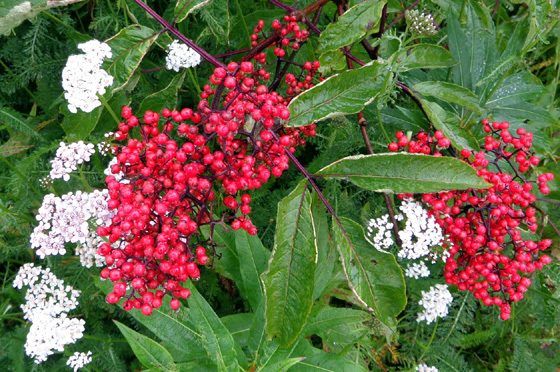 When the top buds open, you know autumn is imminent. I'm glad the state hasn't closed the entire rest area. That's happened in some other states. This rest area has so much going for it that residents and visitors would be very disappointed if it closed, too. 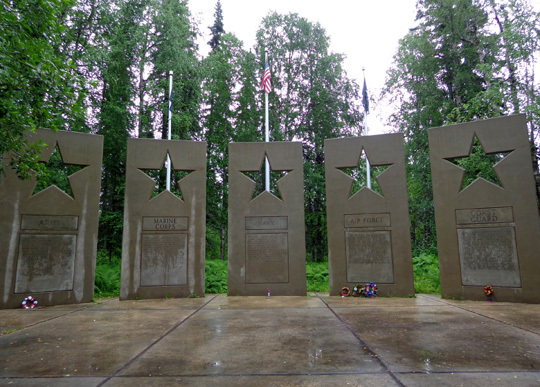 You don't have to be or know an Alaska veteran to appreciate this impressive memorial to each branch of the military, the Coast Guard, the National Guard, the Merchant Marine, POWs, MIAs, recipients of the Medal of Honor, and victims of two nearby military air crashes. As an Army and National Guard veteran, Jim was impressed by the memorial. As a U.S. citizen, I was also impressed. 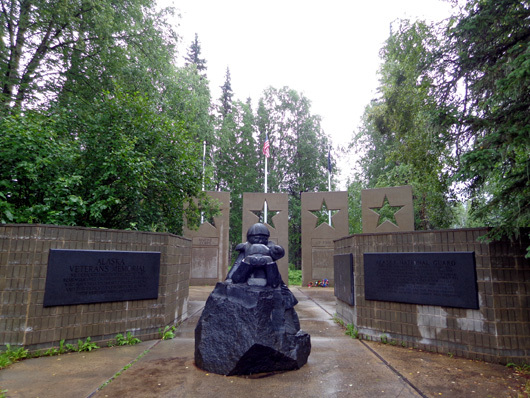 This place truly honors the sacrifices all military personnel have made, not just those from Alaska. In 1954 an Air Force C-47 crashed into nearby K'esugi Ridge, killing 10 of the 16 personnel aboard. 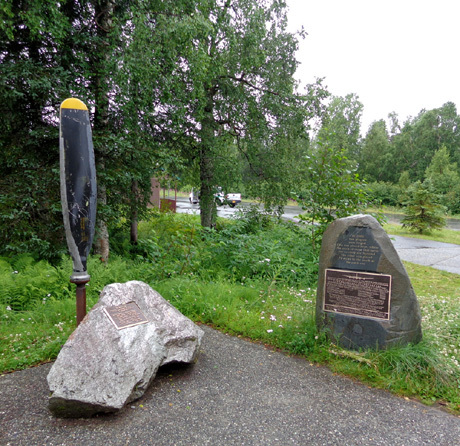 In 1957 a plane stationed at Elmendorf AFB ran into foul weather and crashed into the Talkeetna Mountains, killing 6 of 10 crew members. is from the C-47 that crashed into K'esugi Ridge. 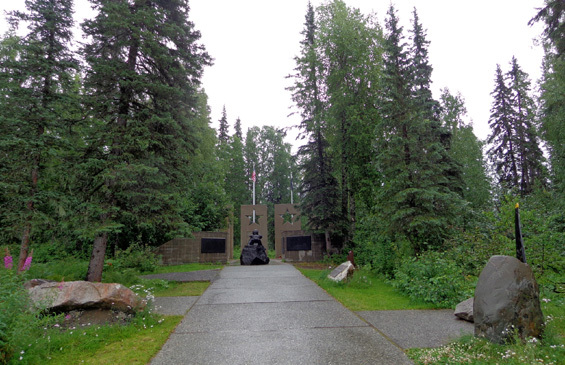 The statue in the center, sculpted by George Pratt, depicts two Alaska Territorial Guards on lookout with binoculars. The plaque on the left has the inscribed tribute I used at the top of this entry. 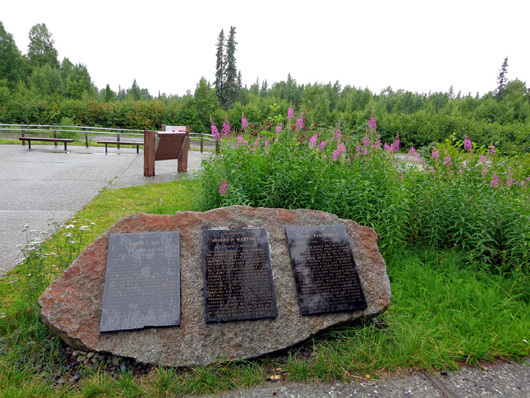 The plaques on the right honor the Alaska National Guard and the unpaid volunteers who served in the Territorial Guard during WWII when members of the National Guard were called to duty. The main memorial alcove was constructed in 1983 and dedicated in 1984. 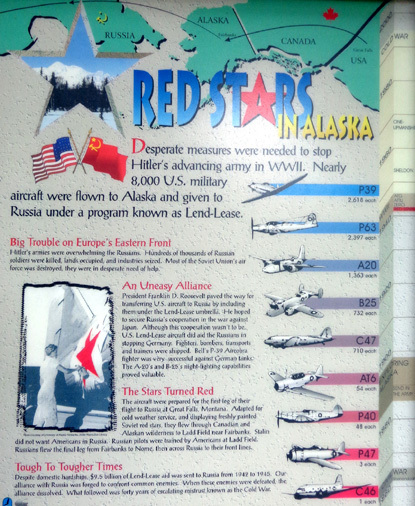 There are also nine or ten detailed interpretive panels at the memorial and the visitor center kiosk that describe the two military plane crashes mentioned above and give interesting historical information about the role Alaskans have played in defending our country. 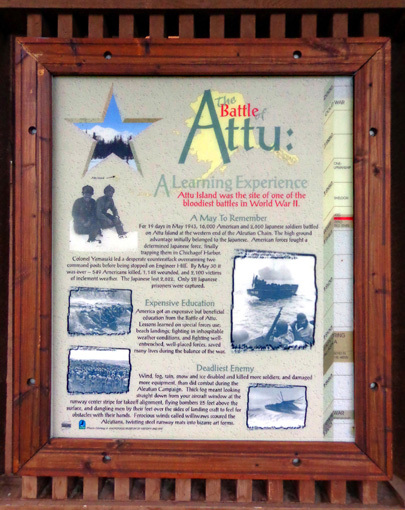 and the use of the Army's High Altitude Rescue Team helicopters since 1954 to revolutionize the rescue of stranded/injured climbers on Denali (most had pulmonary edema/altitude sickness). 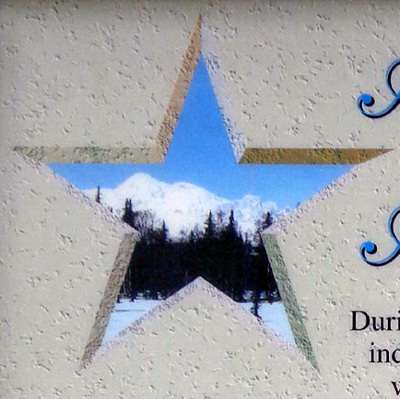 You can spend quite a while reading all this information while you're at the rest area and veteran's memorial. Or you can do what I did and scan each interpretive panel quickly, take photos of the ones that interest you the most, and read them later on your computer! Hey, it gave me something to do on yet another rainy day . . . 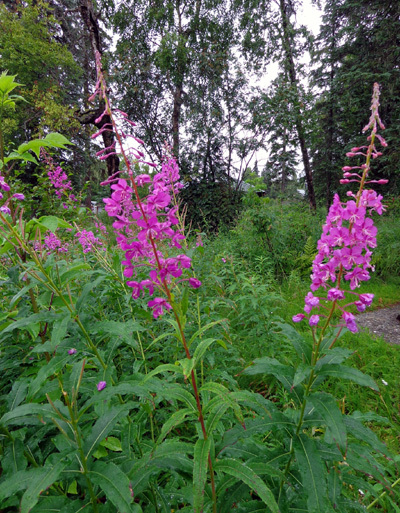 Tomorrow morning we'll head up the Parks Highway to Denali National Park, where we have campground reservations for eight days. It's a relatively short drive for us of about 95 miles. Since we have no TV or internet connection at Byers Lake we don't know what the current weather prediction is for the area of the park where we'll be staying (not far off the highway). 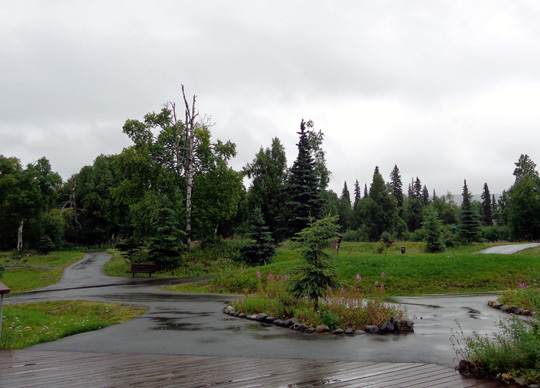 We just hope it clears up enough in the next week that we can get some good views of Denali. We know people who've spent several days there and never did get to see The High One. 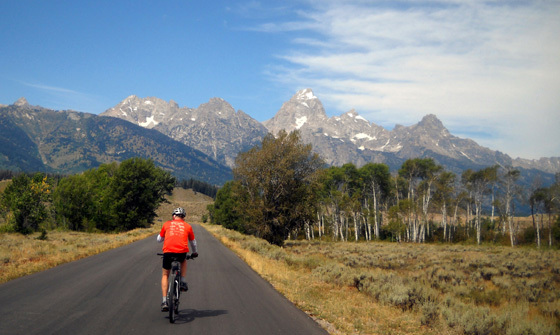 It's shrouded in clouds about 70% of the time in the summer, an elusive tourist magnet.